So, hubby calls to see if I am, by chance, home and willing to whip up a quick lunch. (A very appropriate and routine request, as he works just 5 minutes away.) I love it when there are fresh fillets of thick (thick anything=GRILL!) Tilapia ready in the fridge. I see tomatoes and an avocado, and notice brown rice still hot and fresh in the Zojirushi (ricecooker) from the night before. I start immediately. Total time: It took me about 15 minutes. Love lunch! First, I light the gas grill to 500+ degrees. 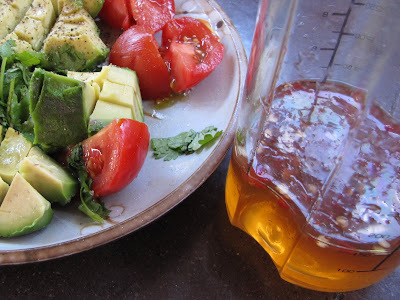 (2) Cut up the avocado and 2 small tomatoes into bite-size pieces and grab a small bunch of cilantro. Salt and pepper it. Set aside. (3) I quickly mix up a Vietnamese-style lime dressing: Pound in mortar 2 garlic clove and 2T sugar. Add and mix in juice of 2 limes, 1/4C rice vinegar, 1/4C fish sauce, 1/4 C water and 1/4tsp chili paste. (4) Place the olive-oily Tilapia onto the grill. Close cover. Temp is at now 500+ degrees. Leave the fish in until the edges char, about 4 minutes. Flip the fillets over to grill the other side. (Careful - keep the fragile fillets from breaking.) Close grill cover. Let cook for another 2-4 minutes. (5) Scoop brown rice onto a plate. Transfer Tilapia directly from the grill and on to the rice. The fish center is is silky white, moist, flaky and the outside is charred, crispy and flavorful. Perfection! (6) Scatter the salted-peppered tomato, avocado and cilantro over the fish. Then pour a generous amount of the Vietnamese Lime Dressing on top of EVERYTHING. Omg, the colors...this dish is just too beautiful! People who like fish LOVE this dish. Add more chili paste (or even better, chop some fresh Thai chili) for a spicier kick. Refreshing, light, beautiful and DELICIOUS. Flavors are incredibly intense. Excellent with a glass of chilled Polka Dot Riesling (sweet). This brown rice was $9.95 a bag - expensive. Feeling a bit indulgent and decadent, I bought 2 bags, and could not WAIT to treat myself to a bowl of luxury rice. Regarding rice, you get what you pay for. Wow, this was the good stuff! Where do you buy the rice? Just like you'd buy beans at a Mexican market, you buy rice at an Asian market.